Some of the earliest mentions found for a proposed civil defense siren system are from 1953, when city officials discussed a possible system of air raid sirens. However, the idea of a civil defense siren system was turned down due to the costs involved. In 1956, the PTA proposed getting air raid sirens for Oklahoma City, though there were debates due to costs and their effective usage. About a week later, Bill Gill Jr. (city manager) ceased the objections to the plan. In 1958, sirens was tested on top of the county building to determine what they would get. An article was published on 1/29/1958 announcing the first test of the some sirens on the county building. The siren test was a success, they were “noisy”. The main siren featured in the article is a Federal Thunderbolt siren. The sirens were later tested from another location. The city would then purchase sirens with money raised by the PTA combined with a civil defense grant. 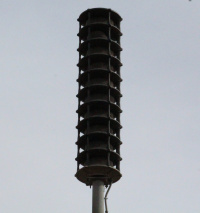 The sirens installed were Federal Signal Thunderbolt sirens. During the Cuban missile crisis, the testing of the sirens was halted. After the crisis was over, the testing of the sirens resumed. Sometime later on, Penetrator sirens(P10s and P15s) made by Alerting Communicators of America were installed. Eventually, the civil defense system was opted to be replaced. On December 19th, 2000, proposals for new sirens were sent out for a new system to cover the entire city. On February 20th, 2001, bids from various siren vendors were received (American Communications, Federal Signal, and Safetycomm). On April 3rd, the city council negotiated a contract with Safetycomm after unanimous recommendation was made by the evaluation team. On May 22nd, a contract with Safetycomm, Inc. was unanimously approved by City Council. 181 sirens on concrete poles made by Whelen Engineering of both omni-directional(71) and rotational(110) types will be installed along with 2 control sites and a radio system at a cost of $4.5million Installations began on July 6th, 2001. On April 16th, 2002, a ceremony dedicated to the system was held at town hall. All changes since has been replacements in case of damages. The current system roughly onsists of 69 WPS-2810s, 108 Whelen Vortex R4s, 1 WPS-2808, 2 WPS-2806s, and a single WPS-2906 which replaced a WPS-2806. In the references is a sketch of the old OKC civil defense system, as well as an old CD siren list. These were generously provided by Raymond D. Woods Jr., a volunteer for Oklahoma County Civil defense in the 80s. ↑ "Current Oklahoma City siren map".